This charming independent studio with pool is situated between the pine woods and the beach, opposite the natural park. Facilities include air-conditioning, integrated, fitted kitchen and bathroom. A front patio for the exclusive use of guests to the studio is equipped with table and chairs, a barbecue, a hammock for unwinding and direct access to the pool which is shared with the main house. The grounds include private parking for one vehicle and a large garden with fruit trees. The studio consists of a double bed and a double sofa bed so it is ideal for a romantic break or for couples with one or two children. The newly-fitted kitchen is fully equiped with electric induction hobs, fridge, microwave oven, kettle, toaster, utensils, and cuttlery and dishes for 4 people. There are recycling bins for organic, paper, plastic and glass waste. In the living room area there is a folding table with four chairs and on the patio there is a teak table, also with four chairs for dining or enjoying aperatifs outdoors under the awning. The bedroom area is separated from the living space by a bookshelf with books in English and Spanish which our guests are welcome to use during their stay. The studio also has a three-door wardrobe and an ensuite bathroom with shower and washing machine which opens directly onto the pool area. On the front patio which has views of the main house, the garden and the pool, there is an awning, a hammock and a barbecue as well as the table and chairs. Access to the studio is through the main gate and through the garden and fruit trees. There is a designated private parking area for guests and the pool is shared with the owners. We look forward to welcoming international visitors to our bilingual (English/Spanish) household. I'm English but met a Spanish girl and moved to Spain around 20 years ago. I'm a language teacher and part-time musician and my wife, Mayte is also a teacher. Cádiz is a fantastic part of the world to live in and has been a great place to bring up our bilingual children. We bought "El Limonar" (The Lemon Grove) in 2015. It's a fantastic place to get away from it all but within a stone's throw by car of many of the province's highlights. El Limonar has all the advantages of a quiet retreat but it is very close to the coast and the vibrant Barrosa beach scene. Fully equiped fitted kitchen in the main living area. Pool shared with main house. Hemos pasado unos días fantásticos, rodeado de pinos muy cerca de la playa. Lugar ideal para pasar unas vacaciones tranquilas y relajarse disfrutando de su entorno y puestas de sol maravillosas. El apartamento dispone dispone de todo lo necesario y si falta algo, están sus dueños Adrián y Maite disponibles y atentos en todo momento para hacer que tu estancia sea lo más agradable posible. Un 10 sobre 10 para el apartamento y sus dueños que hicieron que nuestra estancia en Cádiz fuera inolvidable. Un placer teneros en el estudio, Miguel Ángel! Hasta la próxima!!! On a passé des vacances magnifiques dans un endroit splendide avec des hôtes super ! Je vous remercie! Ce fut un plaisir de vous accueillir dans notre studio! Nous espérons que vous visiterez à nouveau! The studio is located in a very quiet part of Chiclana de la Frontera, between the pine wood and the beaches of La Barrosa and Sancti Petri and opposite the "Parque Natural de la Bahía" wetland park. We are relatively close to various large supermarkets and a couple of smaller shops as well as a bike rental shop, restaurants, etc. 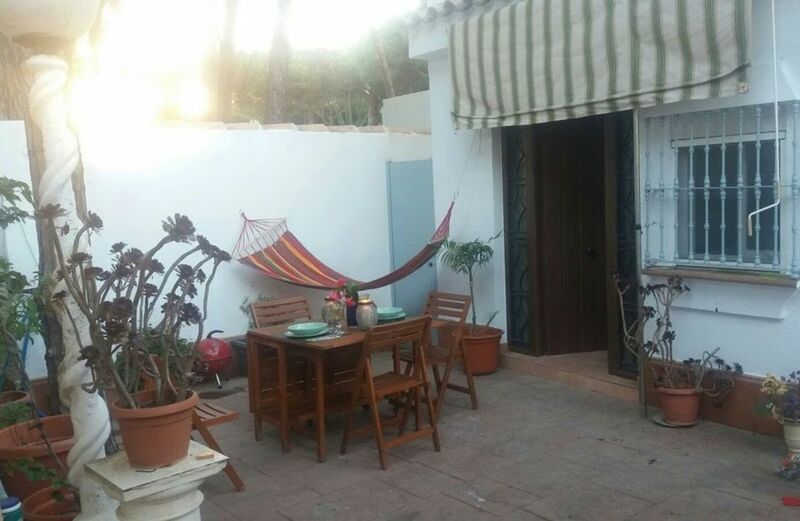 The studio is an ideal place to get away from it all, but it is also close to the beaches and Chiclana town centre. It is very easy to get around by car and by bike (thanks to a superb cycle lane network which covers most of the municipality and the beaches) or by public transport as there is a bus stop at the end of the street. There are also a number of interesting and varied walks nearby. The studio is strategically located some 30 or 40 minutes by car from the majority of the major tourist attractions of the province: The cities of Cádiz and Jerez, the towns of Conil and Vejer de la Frontera, the stunning white villages, the unspoilt beaches of El Palmar, Caños de Meca, etc... There are also three nearby airports: Jerez (45 mins) and Gibraltar and Seville (1h30 mins).